It probably won’t surprise you to find that Android Wear devices, being released more than a year after the Pebble, pack a bit more punch in processing power. That doesn’t necessarily make it better, though. 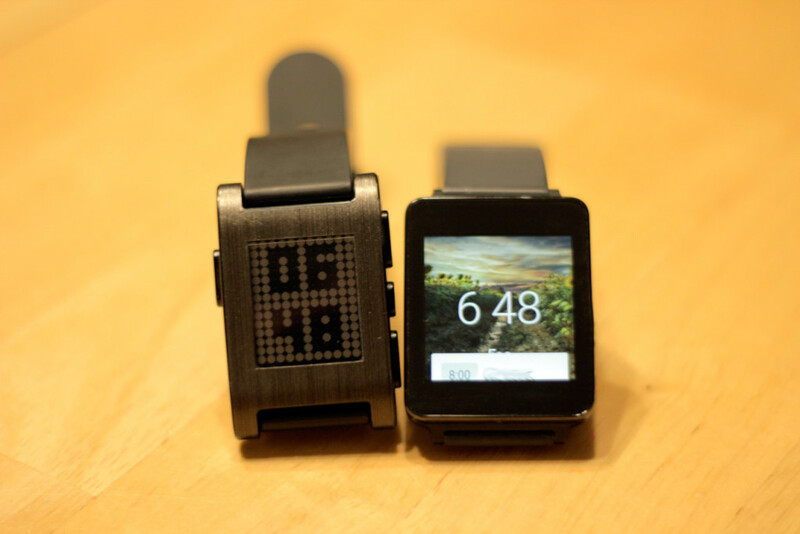 While the LG G Watch sports a full-color capacitive touchscreen and microphone, the Pebble relies on an e-paper display and physical buttons for interaction. This presents some tradeoffs. Android Wear devices are very intuitive and easy to interact with, but on the other hand, the Pebble is completely waterproof and readable in direct sunlight. The Pebble’s battery lasts up to seven days compared to the sub-24-hour battery life of the G Watch, but Android Wear certainly offers more options and power to run full applications. In terms of software and applications, the Pebble is not limited to just the Android platform, working just as well for iOS devices. Unlike other third-party smartwatches, the developers behind Pebble created a very rich and active community. They broke records with their $10+ million Kickstarter campaign, partnered with major content creators, and released updates to their software on a very regular basis. Their latest update even takes advantage of Android Wear’s notifications and response options. While Pebble’s ecosystem is the largest of all smartwatches right now, Google’s investment and support for the Android ecosystem will more than likely result in a larger number of apps coming out for Android Wear over the long run. Obviously, the Pebble is the only real option for iPhone users for now. While I was lucky to find an $80 Black Friday deal for the LG G Watch, Android Wear devices usually start around $200. Pebble, on the other hand, only offers two versions of their device: the standard Pebble for $99 and the Pebble Steel for $199. It’s also important to note that Android Wear devices come in all shapes and sizes. 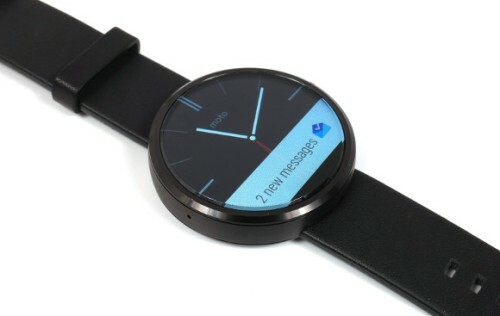 Most notable is the beautifully designed Moto 360 circular face digital watch. Unfortunately, there is no easy answer. They are both excellent smartwatches! It really depends on your lifestyle and what matters more to you: battery life and outdoor activity or processing power and design aesthetics. The Pebble is for people big into outdoor activities involving water, snow sports, or places where you need to deal with direct sunlight. Its waterproofing features keep me from worrying about damage when I participate in any of these activities. I also found my snow gloves would mess with the capacitive screen on my LG G Watch. I still wear my Pebble every time I go skiing. Being able to interact with the watch with thick gloves on is really nice. That being said, the aesthetics, design, and voice input capabilities of my G Watch really draw me to Android Wear for everyday use. I simply love the ability to speak my response to text messages, e-mails, and instant messages without pulling out my phone. The native Google Now integration also allows for more proactive notifications that aren’t so easy to propagate via the Pebble. Since I have good charging discipline, I’m not worried about the one day battery life, either. There’s no question in my mind that smartwatches are incredibly useful in dealing with the notifications and interruptions that come throughout the day. It’s particularly useful when you are on the go or too busy to pull out your phone. The only question that remains is which type of watch is right for you.